Can I change the lyrics with this license? No. One of the limitations of the Compulsory Law is that changes to the lyrics or fundamental melody of the song are not allowed. If you want permission to change the lyrics, the fundamental melody, or the sheet music you need a Print license, which can only be obtained through direct negotiations with the copyright holder. We can help you make your request with our Custom Licensing services. Can I change the melody of the song with this license? Yes. However, you cannot change the fundamental nature of the melody. In other words, the original song must remain recognizable in your new version. Do I get the actual licenses, the paperwork signed by the publishers? No. Under Compulsory Law, no paperwork is received from the copyright holders. Instead, a license is automatically granted and the copyright holder is not required to send any return paperwork. 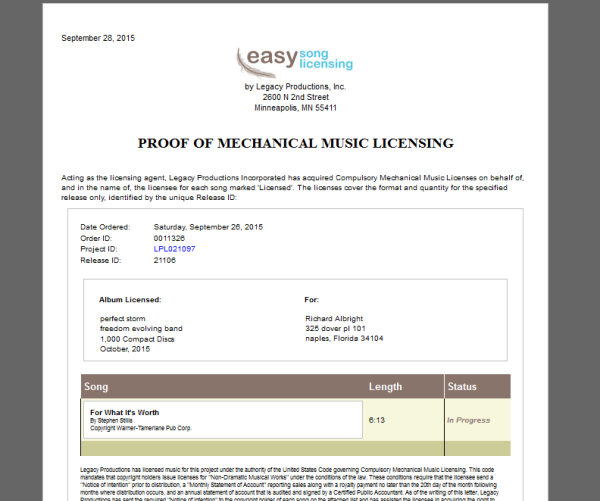 You get a signed PDF document from us explaining our commitment to follow every step of the United States Compulsory Mechanical Licensing law on your behalf to the extent that you may legally distribute your recording of the listed copyrighted songs. If your license request is accepted, yes, you will receive custom paperwork from the copyright holder. Both parties sign the paperwork to make the license official. How is it possible for you to help me license any song? Meant to foster creativity, the Compulsory Mechanical Licensing Law makes it possible for you to legally record your new version of any existing song, even without the copyright holder's express permission. If you ask a publisher directly, they can demand any fee or reject your request outright. But under Compulsory Law, they cannot reject the license. Even in cases where the copyright holder is highly protective of their work, this law allows small-timers to cover some very popular songs. Compulsory law is restrictive and does not cover every use. When your project demands more than the compulsory law allows, Easy Song Licensing’s Custom Licensing services are the answer. We help you submit your request to the copyright holder. However, custom licensing is not guaranteed. The copyright holder has complete control, can set any price, take as much time as they want, and reject the request altogether. What is the licensing process? First, we ask you some questions about your project and about the songs you want to license. You can buy right away for the fastest delivery, or wait for us to research the copyright holders of the songs. You can pay online or over the phone with a credit card or PayPal. After we receive your payment, we follow the Compulsory Law to obtain your mechanical licenses for you. We deliver PDF Proof of Licensing in your email in 1-2 business days. This is what you keep on hand or give to your manufacturer as proof that you have done things legally. We help you submit your request to the copyright holder in the most efficient way, using our years of knowledge, and our proprietary request form. However, the copyright holder can set any price, or reject the license outright. For this reason, custom licensing is not guaranteed.